We will begin this tour in Banff and finish in Jasper which is approximately 288 km or 179 miles. The Columbia Icefield return option is approximately 360 km, or 224 miles. We will be taking the Trans Canada Highway #1 west (with partial scenic route using the Bow Valley Parkway also an option) to Highway 93 or the Icefields Parkway north to the Icefield Center, located in Jasper National Park, where you will have the opportunity to experience Athabasca Glacier firsthand. Enjoy one of the most scenic highways in the world! Journey through five river valleys, the Bow River, Mistaya River, North Saskatchewan River, Sunwapta River, and *Athabasca River Valley and cross over two mountain passes, Bow Summit and Sunwapta Pass. On this driving tour you will be traveling through both Banff and Jasper National Park. 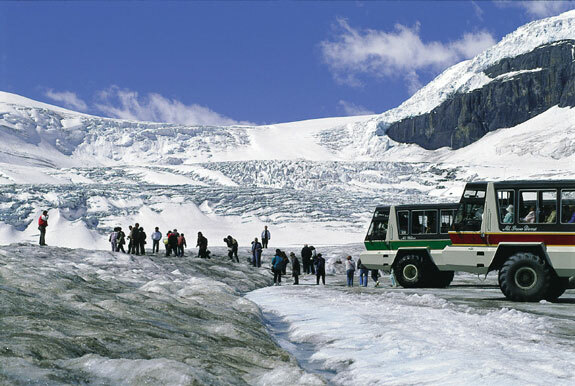 Although this tour is known as the Columbia Icefield Tour, many visitors are surprised at the pure and rugged beauty of the Icefields Parkway, ultimately leading to the awe-inspiring Athabasca Glacier. *Only seen on trip to Jasper, not seen on round-trip version. LET'S BEGIN OUR TOUR TO THE COLUMBIA ICEFIELD! Good morning! Ready for an action-packed day to the Columbia Icefield? First I’d like to welcome you to my home, the Canadian Rockies! Today's tour along the Icefield Parkway to the Athabasca Glacier has a few options. You can do a round-trip tour going as far as the Columbia Icefield and finishing in Banff OR a one-way tour finishing in Jasper. You can also start in Jasper and do a one-way tour ending in Banff. It's all up to you. It is your vacation after all. So enjoy modifying your tour to fit your timeline and your agenda, because we do want your visit to the Canadian Rockies to be your best vacation ever. Our journey will be taking us through five different river valleys and will crossover two mountain passes. We will travel through the montane zone, the subalpine zone, and the alpine zone. If you are in the town of Canmore, Banff or Jasper, you are starting your journey here today in the montane zone (lower than 4500 ft – 1370 meters) with many types of vegetation. Now, if you're starting from Lake Louise, you are already in the subalpine zone. The zones, I refer to are the life zones of the Canadian Rockies and the variety of vegetation will change from zone to zone. The mountains are also divided into three ranges from east to west. You have the front ranges, main ranges and western ranges and each range has a variation of rock type and age. In the front ranges, you have some of the youngest rock found in the Canadian Rockies to areas where you'll find some of the oldest rock, in one particular spot you will pass on your journey is at the junction of the Trans Canada and the Icefields Parkway. The rock found here, is said to be some of the oldest rock found in the Canadian Rockies, dating back as old as 600 million years. So let's get started before I get too carried away. I will be doing the commentary starting from Banff.